Today’s guest post, Deserts Will Blossom is contributed by Lisa Newton of Amateur Nester blog. 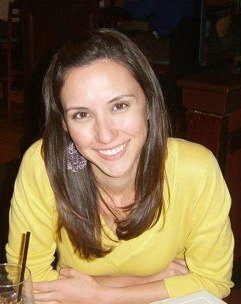 Check out her website to find more helpful information about infertility, as well as her eBooks too, at www.AmateurNester.com. Thanks Lisa for your contribution to Dancing Upon Barren Land ministry! In 2010, I memorized Isaiah 51:3 in the NIV translation. The extended singleness I was experiencing at the time felt like my own personal wasteland, and the Lord used this verse to bring me much comfort.Three years later I was happily married with a wonderful husband. But we were walking through a new wasteland: infertility. That’s when I read the verse for the first time in the NLT translation and it took on a whole new meaning for me. Infertility leaves us barren, infertile. 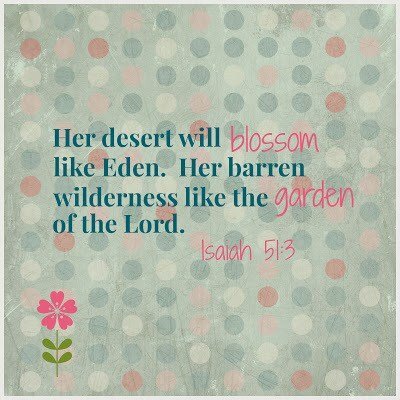 But God promises us that our barren wilderness will bloom and blossom like His very own personal garden. Think about that for a minute. Can you imagine what the personal garden of Earth’s creator looks like? Can you imagine how much water, how much life-liquid is required to make deserts bloom into stunning gardens? And the Master Gardener promises to make our wasteland just as beautiful. We cannot yet know if our flowers and blooms will come in the form of a baby, or in the form of a different plan He has. But we can know there will be joy. And we will sing songs of thanksgiving to Him. May those promises be your comfort in the midst of infertility.